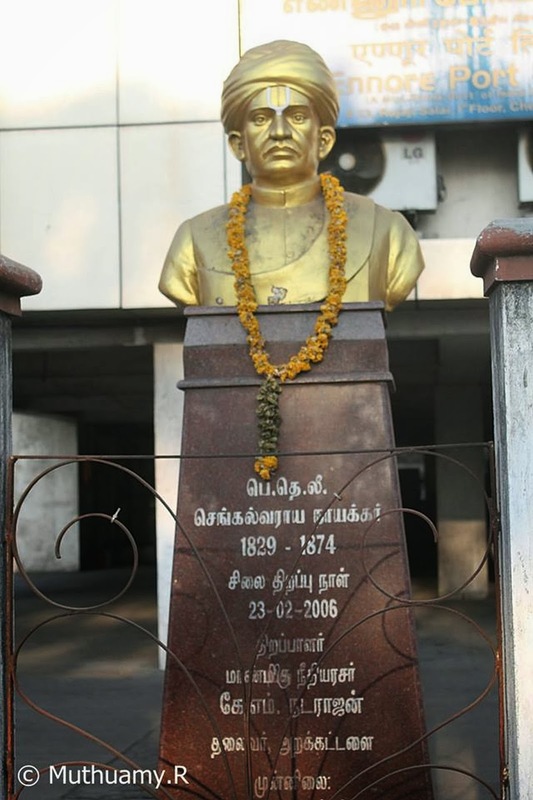 This picture showing the statue of Nobel Philanthropist Sri P.T.Lee Chengalvaraya Naicker (1829 to 1874 ) at P.T. Lee Chengalvaraya Naicker Maaligai, No.23, Rajaji Salai, Chennai - 600 001. It is interesting to learn that Chengalvaraya Naicker served as subedar Major in the Madras Army. He earned the title 'Lee' in appreciation of his service as Dubashi (Translator) in Shand & Co. Chengalvaraya Naicker Naicker died in 1874 at the age of 45. Before his death the philanthropist bequeathed all his properties earned by him out of hard work and formed a trust. His vision for the trust was to provide stellar role in providing education to the masses to make them self-reliant. The above said Trust was functioning along with the famous Pachaippa’s Trust from 1874 to 9.10.96. From 10.10.96 on wards, the above said Trust is functioning independently as per the Supreme Court / High Court/Governing Orders. A commercial school in the name of Chengalvaraya Naicker was established in 1866. Mr. John Adam, who may justly be called the pioneer of commercial and technical education in Southern India, was instrumental in developing the Chengalvaraya Naicker’s Orphanage into a fully equipped Industrial School (Chengalvaraya Naicker Polytechnic College) in 1906. As per the ambition and intention of the Testator, number of educational and medical institutions have been started and are functioning successfully till date.